People with COPD burn 10 times the calories just breathing compared to a person without breathing problems. (1) This can zap your energy. Eating the right foods and the right portion sizes can help you have more energy. There are also power foods that contain a lot of nutrition in each bite. Some people may find themselves getting tired while eating because they have trouble breathing while eating. The key is to eat small portions and eat often. Make sure those small portions are good for you and not junk. If you get too tired later in the day to eat, make your breakfast really count! 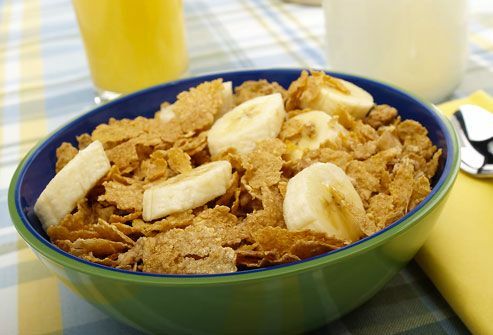 (1) Try eating a high fiber cereal with fruit and milk along with some whole wheat toast. If you like nutrient rich oatmeal, make it with milk so that it packs even more of a nutrient punch. Adding berries or other fruit sweetens the oatmeal naturally while providing more vitamins that are needed. Remember when you were young and your parents told you to eat your meal before eating dessert? This goes for all empty calorie foods. Eat the foods with the most nutrients first before digging into the mashed potatoes or crackers. That way, if you get tired before completing your meal, the food you have eaten will give you energy. Drink plenty of fluids. Not only does dehydration zap your energy, but the fluids help alleviate your COPD symptoms. Drinking fluids help keep the mucus in your airways thin so that you can clear it easier when you cough. (1) Caffeine increases breathing rate, which can put too much stress on the body of someone with COPD. (2) Caffeine can also interact with your medication, which may not let them work properly. (1) For these reasons, caffeine-free drinks are best. With careful planning of the foods you eat, you can boost your energy. The key is to make sure that what you eat counts and stay away from foods that don’t give you the nutrients you need. Eating a variety of the right types of foods and drinking plenty of fluids can help give you the energy you need. Ask your doctor if there are certain foods you should not eat because of your medications or medical condition. You can even ask to speak with a nutritionist to help you plan meals and snacks to boost your energy. ASP does not provide medical advice. If you have questions about your illness or treatment, please contact your doctor. 1. WebMD. COPD: Energy Boosting Foods. [Online] 2011. http://www.webmd.com/lung/copd/ss/slideshow-energy-boosting-foods. 2. Livestrong. The Effects of Caffeine on Breathing. [Online] 2012. http://www.livestrong.com/article/353847-the-effects-of-caffeine-on-breathing/. 3. American Egg Board. The Incredible Edible Egg. [Online] 2012. http://www.incredibleegg.org/. 4. Best Whole Food Nutrition. Why Eat Your Fruits and Vegetables. [Online] 2013. http://www.best-whole-food-nutrition.com/whole_food_articles/eat_fruits_and_vegetables.html.